To think by this time next week I will be in the US living the mundane life is depressing. I cannot fathom leaving Iceland and returning to the US. But first, my adventures of the last 24 hours. I spent Thursday night at Langi Mangi for the Pop Quiz contest. Langi Mangi is the local internet cafe/bar, basically one of the only happening places in the city. So there I was, the tourist, the only Indian (or Asian/other person), hanging out with the locals, drinking beer and answering ridiculous questions about the Nordic countries. Unfortunately RF and I got there late and only heard the last two questions (of which we corrected answered and understood one). RF eventually left and I stayed with the locals and discussed politics, facebook, puppets, and possibly other ridiculous things. Of course, these people were so tall I was sitting in the land of the giants. And not just tall, but gorgeous; the Icelanders are beautiful people. On Friday the class went to the local fish restaurant (same place as the one on Tuesday) and we ate and drank and ate some more. Of course, it helped that our administration was smashed as well by the end and was laughing so hard I thought he would fall into the ocean. I also visited my friend (along with LO) at the tourist office and we partook of Brennivin. Truly a wonderful time to be completely smashed and walking around town. 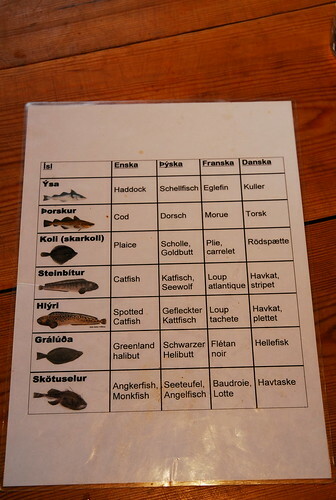 We finally visited the local Icelandic fish restaurant, Tjöruhúsið. Local meaning, a log cabin, a tiny kitchen, and the husband cooking fish on a moving stove. There were three choices: fish soup, catfish, and a type of cod. We choose all of them and then waited. We waited and waited; as the air filled with fish, the time passed slower and slower. Eventually, we received some fresh bread and a stick of butter (literally a square block) to hold us down from clamoring like cats. 30 minutes later and a massive porcelain bowl appeared at the table. It was fish soup. The soup was creamy but not too think and held morsels of white fish that melts in the mouth. Another 30 minutes later, our professor plops down at the table and we partake of more beer while waiting for the main plats. They show up… in large ironclad pans. One pan is filled with cod cooked in a creamy, bechemal type sauce. Adorned with grapes, salad greens (the only time I will be able to forage in Iceland), sliced tomatoes, and lemons, the dish is fit for the aristocracy. Or maybe, just the local fisher families of the WestFjords. Isafjordur, Iceland…a tiny tiny town. 4000 people, one post office, two gas stations, two bakeries. Yet, amazing to live in the fjords. Tall, unwavering, impressive mountains carved in zig-zags. Located near the Arctic circle (66.1N instead of 66.5N), it is good enough to be the Arctic. Written in Icelandic as Ísafjörður, with some very cool nordic characters not seen in the Latin language system. Ísafjörður is the largest town in the Westfjards (Vestfirðir) region. It was formed in the 9th century and became a major port city by the 16th century. 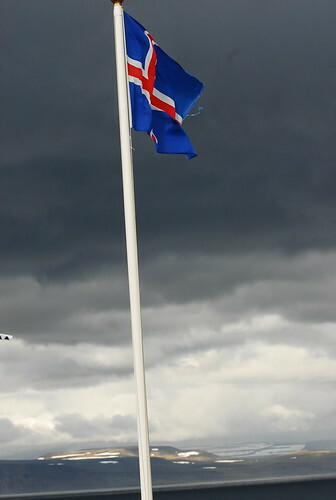 In 1786, the King of Denmark (Iceland was a Danish colony) granted Isafjordur municipal status. He also abolished the Danish trade monopoly. From the mid 1800s to late 1900s, Isafjordur exploded in population and became the center of the fishing industry. It was the city’s golden era of prosperity. Iceland’s largest saltfish exporter, Ásgeirsverslun, hailed from the city. Motorized boats for fishing and freights enabled the town to expand into shrimp. Post World War II, the invention of quick-freezing created another golden era for Isafjordur. Hundreds of packing plants sprouted up in the city and every local was connected to the industry. But Isafjordur’s fishing success would not last forever. A worldwide economic recession in the 1980s paralyzed the industry. But the Icelandic strength and will power would not allow the industry to perish, and it became leaner, smaller, and still competitive. The fishing industry changed its focus to a fleet of small boats rather than the big trawlers of the 1970s and early 1980s. High-tech industries and research, based on the knowledge and tradition of the fisheries developed, creating more opportunity for the town’s citizens. And of course, the town is on the map with numerous tourist opportunities. Isafjordur also hosts a small university that has its strengths in the Icelandic Summer Course program and graduate studies programs. As I’m here studying there, I’ll give a review of the program soon. Check out beautiful photos of Isafjordur; they should convince anyone to visit. Let’s face it, there are not many options in the city but there are still great spots. Café, bar/pub in central Ísafjörður. Lunch menu, soup of the day, sandwiches, burgers, pitas. Wireless connection, live music. Licensed. Open Mon-Wed: 11:00-23:00, Thur: 11:00-01:00, Fri: 11:00-03:00, Sat: 12:00-03:00, Sun: 13:00-23:00. Address: Adalstraeti 22, Isafjordur. Tel: (+354) 456 3022. Located next to the Isafjordur Maritime Museum at the waterfront. 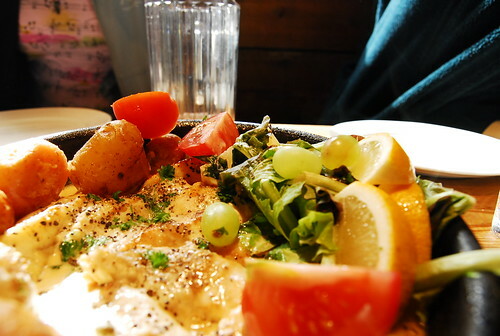 The restaurant is owned by a quirky couple but they server amazing Icelandic fish dishes. The building is also one of the oldest in the city. Specialize in fresh catches of fish and fish soups. Open daily during the summer 11:00 – 22:00. 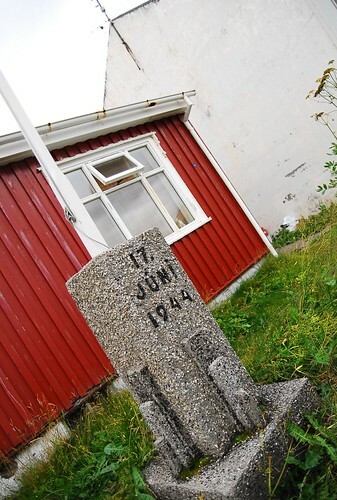 Address: Nedstikaupstadur, Isafjordur. Tel: (+354) 456 4419. A Thai-restaurant next to the grocery store in the little mini-mall. Great price for a lot of food. Address: Austurvegur 1, Isafjordur. Tel: (+354) 456 5001. Has tasty cakes, pastries, pizzas, and soups. Hours: weekdays 07:30-18:00. Closed Saturdays. Sundays 09:00-17:30. One of Iceland’s most famous bakeries with tons of breads and pastries. You can even find bagels there. Hours: weekdays 07:00-18:00, Saturdays 07:00-16:00. A very “American fast food” kind of place. Pizzas, hamburgers, sandwiches, hot dogs, etc. Some groceries (ie. milk and bread) and DVD rentals are available. Oh, they also have plenty of candy (godis). Brand new café and restaurant in the Edinborg culture house, where the Tourist Information centre is also located. Light meals all day every day, brunch on weekends. Open: weekdays 11:00-01:00, weekends 11:00-03:00. Address: Adalstraeti 7, Isafjordur. Tel: (+354) 456 4400. Petrol station, fast food, groceries. Open: work days: 07.30-23.30, weekends: 08.30-23.30. Komdu Saell, Hello in Icelandic! …wait, wrong language… Ni hao! I have finally arrived to Isafjordur…a town that literally can be tucked away in Memorial Stadium and the parking lot. ;) It is beautiful here: the massive fjords, dangling remnants of snow, the Arctic Ocean (maybe North Atlantic) and the colorful houses littering the landscape. I have plenty to post so do check out the blog and flickr for tales, sagas, and of course, photos. It’s been 32 hours of traveling, 6 airports, 1 bus station, and 3 taxis. time for bed (i know at noon). Author SapphirePosted on August 18, 2007 June 2, 2009 Categories iceland, travelTags iceland, isafjordur, travelLeave a comment on Komdu Saell, Hello in Icelandic!